(April 21, 2014) The Charlotte Area Transit System (CATS) is hosting an open house to share information about a planned service expansion to the new Charlotte Premium Outlets. The new mall is expected to open July 31, 2014. CATS was recently awarded a Jobs Access Reverse Commute (JARC) grant to expand service to the growing area. 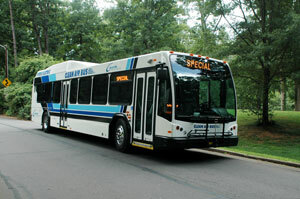 CATS is planning to extend Route 55 service to the mall starting June 30, 2014. Additional service is also proposed on weekends, serving jobs in the Westlake Drive industrial area. Open houses are designed for you to drop in anytime during the meeting hours. CATS wants your feedback and encourages transit customers and members of the community to attend the meeting to learn more about the proposed expansion of Route 55. CATS also will host meetings at the Steele Creek Apartments and the International Paper Company that are intended to target existing customers at those locations. For information about any of these meetings or the route change, contact Brian Horton of CATS at bhorton@charlottenc.gov or 704-353-0018.